This post originally appeared on Larry Kless’ Weblog: Quickly and Easily Master Online Video Promotions and Watch Your Sales Skyrocket – Eastbay LocalPreneurs Meetup Group, May 18, 2010 on May 24, 2010. 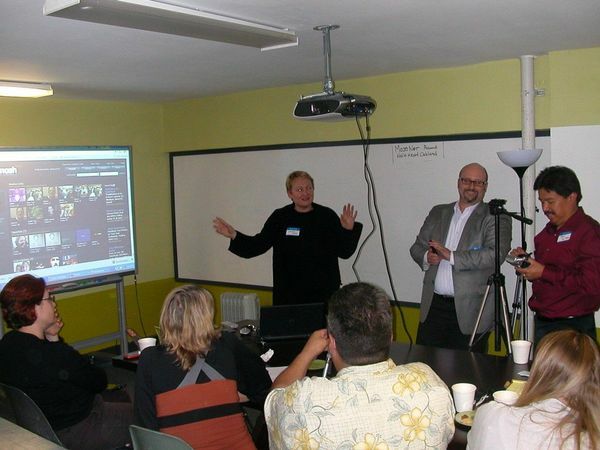 On Tuesday, May 18th, 2010, I spoke at the Eastbay LocalPreneurs Meetup Group about how you can use low cost video tools and creative techniques to boost your business. The title of the session was, Quickly and Easily Master Online Video Promotions and Watch Your Sales Skyrocket, and covered the online video industry and trends, tips for producing online video for business, specific platform you can use to broadcast yourself and, some of my favorite online video resources. This Meetup group is organized by my friend and local entrepreneur, Jonathan Fleming, and was held at Tech Liminal in downtown Oakland. About 15 of us gathered in the friendly salon atmosphere of Tech Liminal, and the energy was high and the group really engaged on the topic of online video. Just about everyone who attended used video in some way either for personal or business use, and shared their tips and experiences. We were also treated to an impromptu demo of a new online video editing tool called Minimash, from our local entrepreneurs Claudia Ward and Mark Gartland. Minimash is a self-funded startup ready to come out of stealth mode and looking for an angel investor. The software is really intuitive and fun to use and takes a similar approach to online video mashups like Animoto, but to all whole new level. Look for more on Minimash in the near future. Jonathan wrote a great summary of the event on the Meetup site which I’ve included below. “If you missed it, Larry Kless gave an awesome presentation on the many powerful uses of “Online Video” to help promote, make sales happen and brand your business! Rodil San Mateo (Eastbayloantips.com) opened up discussing the various ways he uses video to help Realtors showcase properties better; improve their search engine rankings; and get sales results from their marketing. Rodil showcased some of the tools he uses daily to help run his mortgage business.To close it out, a very creative, innovative startup named Minimash.com dropped in to give an awesome presentation on their upcoming product which I think will be awesome! An Oakland based company at www.minimash.com for more info. It was very inspiring to meet the founders and I felt as if I was meeting an early stage superstar company! Meetup is the world’s largest network of local groups. More than 2,000 groups get together in local communities each day, each one with the goal of improving themselves or their communities. If you’re in the Bay Area and a local entrepreneur, it’s crucial to understand how to make the right connections, get the tools and inspirational education in order to grow your business. Eastbay Localprenuers Meetup brings you fresh speakers, monthly training and networking to jump-start your projects and dreams. Join this Meetup group here or sign up using Facebook. Many thanks to Jonathan for organizing for the event and to Anca Mosoiu for hosting it at Tech Liminal. Also thanks to Rodil for kicking it off and proving some context for how businesses can use video to engage customers. Most of all, my thanks to all who attended and contributed to the conversation. I look forward to seeing you at another upcoming Meetup.